For European Gangs, A Gem Of A Growth Industry: Jewel Heists : Parallels From spectacular smash-and-grabs to stealthy lone thieves, sophisticated crime networks have carried out a wave of high-profile jewelry heists in Western Europe this year. Experts say worldwide jewelry thefts total more than $100 million annually. With such high stakes, criminals are willing to risk jail time. 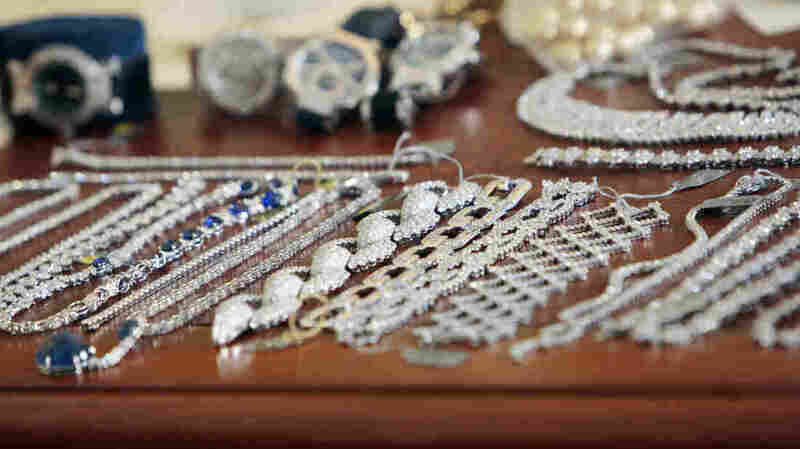 Police display some of the jewelry recovered from the 2008 robbery of Harry Winston jewelers in Paris. Thieves snatched loot estimated to be worth $105 million. Thieves, using axes and smoke grenades, break into a Swiss luxury watch store and make off with more than $2 million in loot. What sounds like a scene from the latest Hollywood crime caper actually took place earlier this month in central Paris, in the latest in a wave of high-profile European jewelry heists. It's been a particularly rich year for thieves in Europe, who have stolen tens of millions of dollars in diamonds and other precious gems so far. Worldwide jewelry thefts total more than $100 million each year, according to the FBI. By European standards, the latest heist in Paris is pretty small potatoes. Compare it to the $105 million worth of rings and necklaces that were snatched in 2008 from the Paris outpost of Harry Winston, a premier American jeweler, or the $50 million worth of gems stolen from a plane waiting on the tarmac in Brussels earlier this year. And there's the whole string of high-profile jewel thefts in southern France this spring, including one at a hotel in Cannes where a lone thief made off with more than $135 million in diamonds. 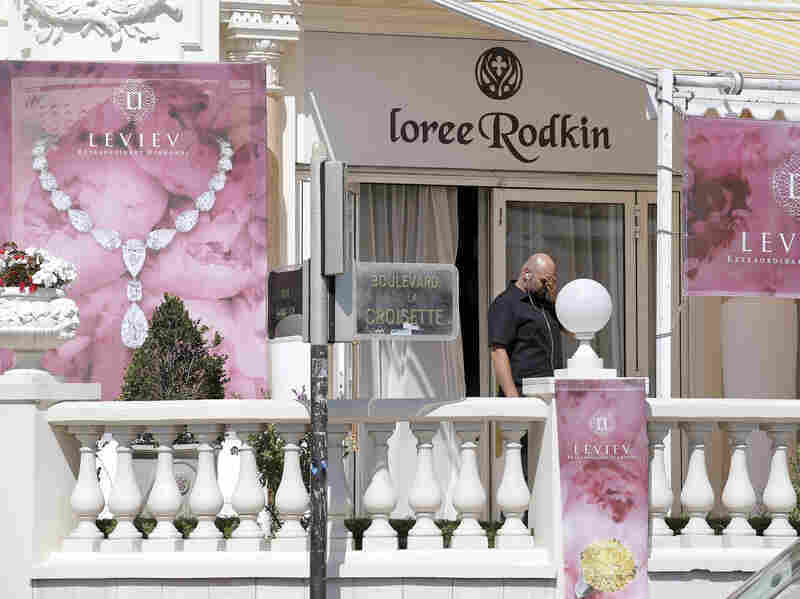 In July, a thief walked into an exhibit at the Carlton InterContinental Hotel in Cannes, France, pulled a gun on unarmed guards, and made off with a suitcase full of jewelry. Scott Andrew Selby, author of the book Flawless: Inside the Largest Diamond Heist in History, explains what happened. "A thief came in the morning, went quickly through some doors that were supposed to be locked, pulled out a gun and managed to get away with the fortune in diamond jewelry, and just hopped right back out on the main promenade and disappeared into the crowd," he says. The robbery took place at Cannes' luxurious Carlton InterContinental Hotel — the same one featured in the Alfred Hitchcock classic To Catch a Thief. 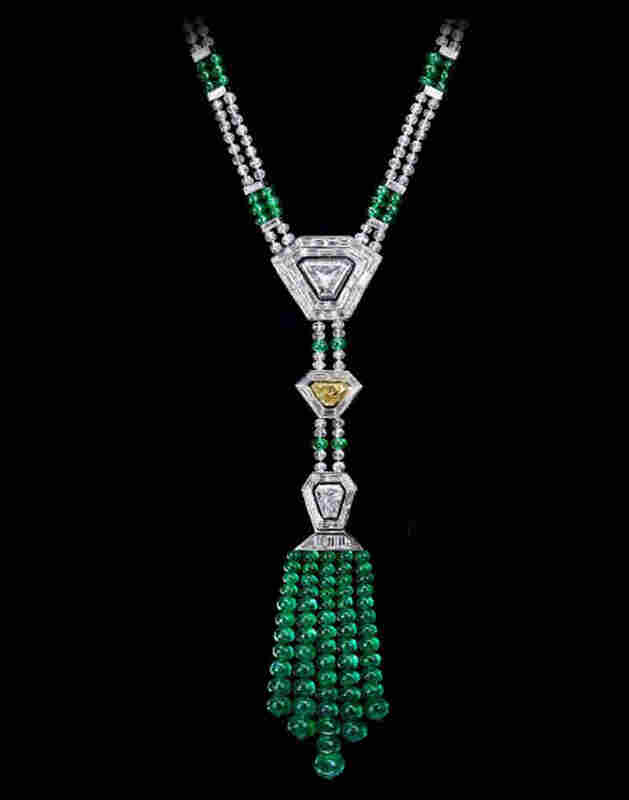 The diamond jewelry — all distinctive pieces — belonged to Lev Leviev, an Israeli businessman. The security guards were not armed. John Shaw is a managing director with SW Associates, a Paris-based loss adjuster and risk manager working on the case. He says jewel theft is a boom industry in Europe, particularly France. "I think what we're seeing on a worldwide basis is the opposite of a treasure hunt — wherever the very wealthy go, there are people running after them with trays of jewelry," he says. As the borders of Europe are pushed eastward, Shaw says, more criminals are heading to Western Europe. There's a lot of money involved in jewel heists, he says, and the criminals aren't afraid of going to jail in the West. Shaw says his company, on behalf of its client, Lloyds of London, has offered a $1.3 million reward for information leading to the recovery of the jewels taken in the Carlton heist. He says they are looking closely at about 300 tips. The movies often romanticize spectacular jewel thefts. In To Catch a Thief, for example, Cary Grant plays John Robie, a dashing former cat burglar, pursued by a beautiful socialite played by Grace Kelly. Selby says nowadays jewel heists tend to be carried out by organized networks. That lone thief in the Carlton robbery? He is believed to be part of a larger gang. One such gang is the Pink Panthers, an international syndicate of professional thieves that emerged from the former Yugoslavia. Subtlety is not their specialty — driving cars through storefront windows, smashing and grabbing, guns drawn. Selby says the group has been successful going in fast and hard, and grabbing as much as they can. "Interpol believes that the Pink Panthers are responsible for hundreds of millions of dollars in thefts since the late '90s," Selby says. "The number just keeps moving up." Selby says another network is called the School of Turin, thieves who come together for individual low-key heists, developed over long periods, who in 2003 in Antwerp, Belgium, were behind the world's biggest diamond theft. "They tend to have the jobs that give them skills that are useful as well as providing cover in the community," Selby says. "So for instance, one guy has an alarm company; one guy has a locksmith company." John Kennedy, the president of the New York-based Jewelers Security Alliance, a nonprofit organization that compiles data on crimes against the jewelry industry, says the U.S. has its own organized crime groups. "The gangs that hit traveling [jewel] salesmen on the road are Colombian and South American gangs," he says. "The gangs that commit the burglaries of retail jewelers are a mixed lot — we have Cuban gangs, we have domestic gangs in Texas, gangs from Ohio." But jewel heists in the U.S. are much smaller than those in Europe. Kennedy says that's because inventories at shops and exhibits in Europe are bigger; there are high-end jewelers constantly moving in and out of London and other cities; and customers tend to make enormous purchases. A couple of million dollars in stolen gems in the U.S. would be considered a very, very big hit, he says. As well, Kennedy notes, there's been a dramatic decline in jewel thefts in the U.S. since the late 1990s, in large part due to better law enforcement, greater cooperation among jewelers, and through information and images shared on the Internet. Importantly, European guards are often unarmed. Still, Kennedy says a lot of hot gems make their way into the U.S. market. He says stolen diamonds can be recut, identifying marks can be removed, and the gems can be resold by questionable jewelers. "There's a huge international diamond trade; it's constantly going all over the place, back and forth and all over," Kennedy says. "Many of the diamonds that have been stolen in Europe and even in the Far East have shown up in New York." John Shaw, the loss adjuster, says loot is often recovered. He says about half the jewels taken in the $105 million Harry Winston robbery have turned up — most notably, in a drainpipe. Other pieces are hard to move. Shaw points to the heist at the Carlton Hotel, where the stolen items are more like works of art than jewelry. "My gut feeling is that they didn't know, and probably still don't know, what to do with these things," he says — adding that they would have been better off taking the small accessory pieces and leaving the big pieces.